This is the first in a two-part article. Today we’ll try to tease important insights from recent research, and tomorrow we’ll explore how those insights can be applied to B2B marketing challenges for SMB manufacturers. Conversations about B2B marketing with senior executives, particularly manufacturing folks, have several common themes. It’s really uncanny how so many unrelated conversations with executives at various size companies across diverse industries follow the same pattern. Clearly there’s a common experience and shared skepticism of B2B internet marketing. Today’s new marketing “rock and roll” hasn’t convinced many in the manufacturing world. And as this recent Adobe ad illustrates, one can empathize. As the fall marketing conference season winds down, the reports, studies and surveys are flying like the leaves here in New England. There’s no shortage of hyperbole and grandiosity. But there’s also some fascinating research that confirms the gut feeling of all those skeptical executives with whom I speak– AND it simultaneously refutes their conclusion. Embracing Digital Technology: A New Strategic Imperative - is an MIT Sloan Management Review look at enterprise wide adoption of digital technology and the risk of competitive obsolescence. It focuses on organizational risks of, requirements for, and obstacles and avenues to adoption of digital technologies. It isn’t focused solely on marketing, but to the extent that marketing is increasingly digital, many of the insights apply. Digital Distress: What Keeps Marketers Up at Night – reports research conducted by Adobe in conjunction with Advertising Week. As one might expect it’s somewhat less strategic in scope than the Sloan study. Rather it’s a series of data points presented in attractive graphs and illustrations. But, wow! Some of those data points are telling! 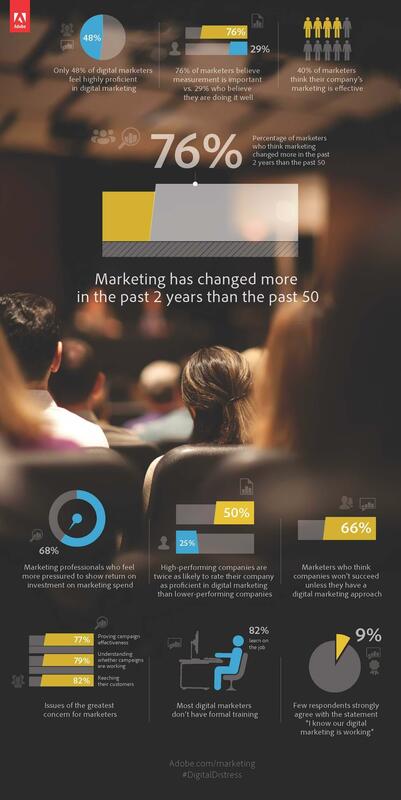 2/3 of marketers say that the practice of marketing has changed more in the last 2 years than in the last 50! >50% say digital marketing is evolving through ‘trial & error’ – you might be ok with the trial part, but the error? And tomorrow we’ll take a look at how this data (any of it resonating with you?) should impact the way you approach the challenges.